I visit alot of blogs where the F.O.s, even the W.I.Ps, are photographed beautifully. There’s no talk of the agitation with some of these projects, you just get the awesome result. Since this blog is really my electronic version of “Dear Diary” I’m going to start posting about every blooper associated with projects, be it yarny or not, simple or intricate. Hopefully, they’ll accurately reflect the entirety of my crafty journey and maybe encourage newbie crafters to keep trying no matter what. First I missed part of a row (Downton Abbey I blame you!!! 😛 ), but I also realised after I was done that the fabric produced became less stretchy the larger the square became. I’m still in love with the texture but from the pic above the square moved from 10 inches across to 8 inches. Although I tried to stretch it out, tried to kill the acrylic through blocking, it was not happening. Whomp, whomp! Previous Article Downton Abbey — Seriously? Please don’t discard, or unpick this. It is a beautiful pattern (‘design feature’ and all… that’s what my sister calls her ‘oops’ areas 🙂 I’m sure we could add a border to get it to the approximate size… think log cabin style. This is too pretty not to be included. it really is a beautiful texture! I’ve been known to swatch from time to time (shh don’t tell) 😉 Good luck with it! what an interesting stitch! what is it? That’s why connect … we think alot alike for so many things. 😀 I find some of them frustrating too especially when I have questions about the same projects they did. Honestly, I could have tried hard with the blocking (like break out my home steamer instead of using the iron) but I’m going to redo it anyway to fix that error. That’s so obvious, I can’t call that a design element. LOLOL! 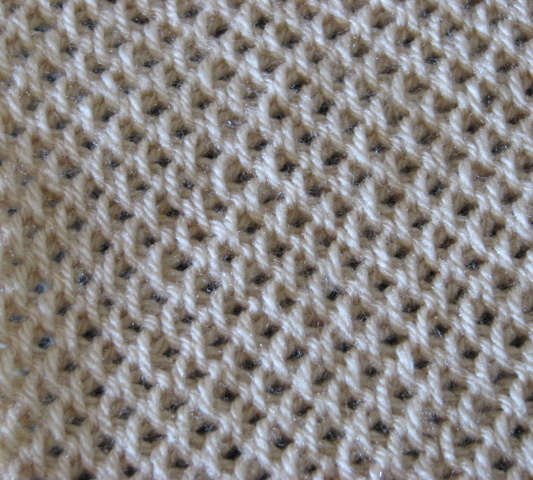 The stitch is from the Knit & Purl: 250 stitches to knit edited by Erika Knight. 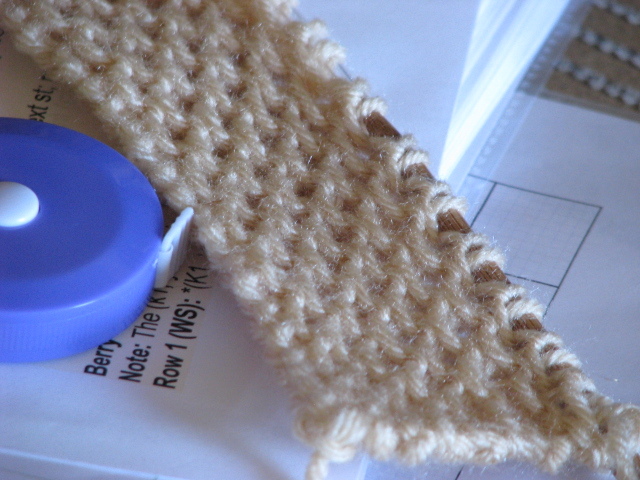 It’s called the Loop Stitch. I know other people have said the same thing as you but I’ve seen people block acrylic with a home steamer or even a steam iron. Not sure if you’re on Ravelry but it’s amazing to see the transformation of the acrylic projects by the use of blocking. This is an awesome resource on acrylic blocking. 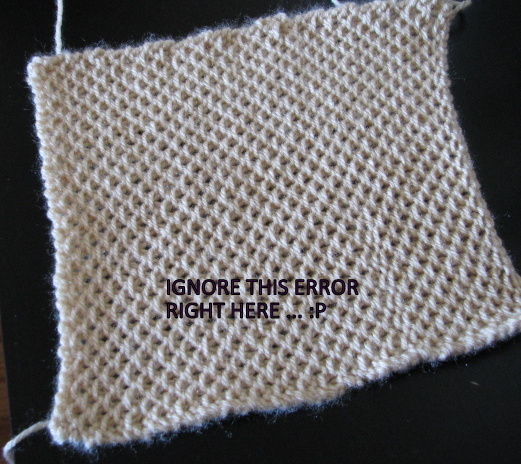 I think in my case, the stitch pattern stopped me from being able to do that. Wow – I’m impressed! I had no idea acrylic could be blocked. I had only tried wet-blocking so that explains why I was unsuccessful. Next time — I’ll try steam. Thanks for the link! Yes maam. You’re welcome. 😀 You should see some of the blocked beauties in the Yarn forum blocking thread. Some people have successfully blocked intricate lace knitting items. Awesome inspiration in that thread. Here’s a starting place. If you scroll through that thread you’ll find awesome examples … if you’re on Ravelry. I’m on Ravelry and I checked out that thread. I’m amazed. Yes, I’ve made some indestructible acrylic items but I had always assumed blocking wasn’t possible. I’m a changed woman! Thanks!